Skills: 4+int modifier, quadruple at 1st level. The medusa’s class skills (and the key ability for each skills) are Bluff (Cha), Craft (Int), Disguise (Cha), Move Silently (Dex), Profession (Wis), and Spot (Wis). Medusa body:At 1st level a medusa loses all racial bonus she had and gains monstruous humanoid traits (basically dark vision 60 feets). She's a medium monstruous humanoid with base speed 30. 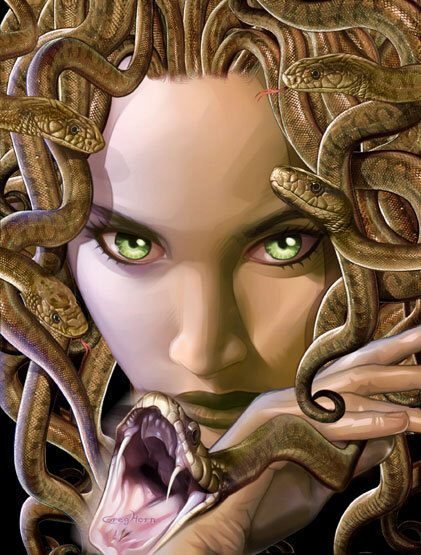 A medusa's hair transforms into living snakes, wich may be used as a natural weapon dealing 1d4 +Str modifier damage. All the snakes count as a single natural weapon. The snake heads produce a poison dealing strenght damage. The Fort DC is 10+1/2 medusa's HD+medusa's con modifier. A medusa gains a bonus to Nat Armor equal to her Con modifier. As long as the medusa covers her snake-air and eyes, she can pass as an human whitout need of disguise checks, unless she's observed by an adjacent creature, at wich point she can still pass as an human with a sucessfull disguise check. For a total of +5 Dex and +5 Cha at level 7. Stone glimpse:At 3nd level a medusa's stoning powers begin to awaken. She can't yet turn a creature into stone in one go, but can partialy petrify them. As a standard action, a medusa can "stone glimpse" a creature whitin 10 feets(+5 feets for each HD beyond the first 3). The Fort DC is 10+Half the Medusa's HD+Medusa's Cha modifier. If the target fails the save, it takes 1d4 Dex penalty as their bodies partialy petrify. The damage increases by an extra 1d4 for every 3 extra HD of the medusa. This attack doesn't affect creatures immune to petrification. The medusa may use stone glimpse a number of times per day equal to her HDxCha modifier. Poison Dip:As a move action, a medusa may poison a weapon she's holding. The medusa doesn't risk poisoning herself, but such poison only remains "fresh" for 1 hour per HD or untill the weapon strikes, after wich it dries out and becomes useless. It has no commercial value. Thus medusas prefer bows as they can poison several arrows in advance. Sudden bite: The medusa's snakes develop a will of their own and thus become able to attack whitout need of the medusa's commands. The Medusa may user her hair-snake attack as a swift action. Stone glare:At 5th level, the medusa can now instantly petrify a creature if their eyes directly meet, but it demands they both look at each other for some seconds. Same range and DC as stone glimpse, but the target gets both a will save and fort save to resist this effect. If it fails both, then it's instantly turned to stone as a flesh to stone spell. A stone glare costs two uses of stone glimpse. If the medusa has 8 or more HD, a fraction of second is enough for the petrifying to happen, and thus the target only gets a fortitude save to resist this effect. Vitriolic poison:At 6th level, the medusa's poison develops powerfull acid properties. It can now affect creatures immune to poison and ability damage, but it deals only half Str damage to those. Stone gaze:At 7th level the medusa can now temporaly fill her eyes with stoning power, affecting all who look at her. Activating the stone gaze is a standard action wich costs four uses of the medusa's stone glimpse ability, and then one extra use for each turn she sustains the effect. She may end the gaze at any moment as a free action. Same range and effect as stone glare , but now all creatures whitin range are automaticaly affected. A medusa of 10 HD or more may activate any of her eye attacks as a swift action. A medusa of 15 HD or more may activate her eye attacks as an immediate action. This bonus applies even if not all medusa levels were taken, but only for the obtained eye attacks. Finally, if all levels of this class were taken, at 9 HD a Medusa's eye attacks can affect oponents immune to petrification, but they gain a +5 bonus on their saves. So yeah, the medusa gets a save or die at 5th level, but it demands two saves for it to work. As the medusa levels, it becomes only 1 save. And no, you're not geting an at will save or die attack. Besides the stoning attack, she only has her poison really, so I give her a couple extra custom abilities, full BAB, 4skill/level, +5 Dex and +5 Cha plus two good reflexes to try to make up for it. And the ability to partially ignore immunities because really, at high levels everything would be immune to petrification and poison.